Organic pasta made with 100% green pea flour. This delicious pasta is made from 100% organic green pea flour. It contains no cereal, is high in protein, and has more fibre and less carbohydrates than conventional types of pasta. It is also a good source of iron and phosphorus. It is easy and quick to prepare (about six minutes of cooking time) and makes a very attractive meal, both hot and cold. Because of its delicious green pea taste, it can be enjoyed simply with a bit of olive oil and salt. 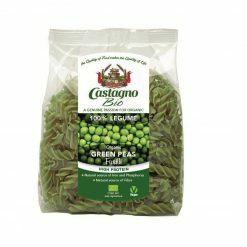 CastagnoEEs wide range of pasta is produced near Turin, in Italy. For more than a century, the company has been a family business. Its philosophy combines enthusiasm and a love of nature to create wholesome, organic products of exceptional quality. The companyEEs unique milling process enables the production of 100% wholemeal flours that preserve virtually all the properties of the original grain, from the field to the plate. Even the outer husk, which is the main source of the grainEEs vitamin content, is left intact. A slow-drying pasta-making process, conducted at low temperatures, allows the original qualities of the raw materials to be preserved. The range available in Japan includes organic durum wheat and organic wholewheat spaghetti and penne. There is also a range of pasta produced from pulses rather than wheat: green peas, chickp” red lentils. All products are suitable for vegetarians and vegans. Since 1912, three generations of millers at the company mill have been producing authentic flours that retain the properties of the original grain. As well as processing durum and soft wheat, Castagno specialises in grinding other types of cereal, pulse and seed. Only the best raw materials are chosen and purchased directly from the companyEEs growers. All the milling, pasta-making, extrusion, flaking and toasting processes necessary to create the products are carried out at the companyEEs Italian base, including a series of rigorous checks and controls along the entire production and distribution chain. A stringent safety procedure ensures the very highest standards.